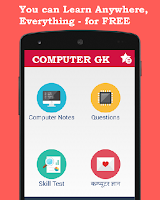 कंप्यूटर सामान्य ज्ञान प्रश्न (Computer GK Quiz in Hindi) GK Sample Question Paper No. 38: Computer GK Sample Question Paper No. 38 as part of Computer GK Sample Papers for Competitive Exams, PSU Exam, State Govt & Central Govt. Examinations held each years. Here is Computer GK Questions asked in Staff Selection Commission (SSC) Clerk Examination 2012. 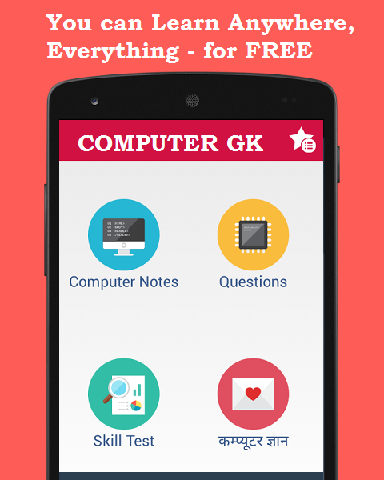 SSC Clerks Exam Paper contains total 20 Questions which you can access from our Free Mobile App of "COMPUTER GK" from Link: DOWNLOAD COMPUTER GK Mobile App . Here is sample Question paper as part of Computer GK Questions for upcoming examinations. "0" और "1" पर आधारित नंबर सिस्टम को क्या कहते हैं? एक बिलियन करैक्टर को निम्न में से कौन निरूपित करता है ? ROM का पूर्ण रूप क्या है ?